The Moon in the Mango Tree by Pamela Binnings Ewen. I read most of this book from Salt Lake City to JFK. It was a direct flight so I didn't get to finish. This book was for my book club at church. The club met for dinner and had a phone interview with the author. I missed it because it was my husband's birthday, but I did get to read the book. It's one of the better books from my club, but it seemed a little disjointed. Usually 'Christian' fiction hammers you over the head (and I don't like that), but this one seemed to almost miss the point. It's a fictionalized account of the author's grandmother's time in Siam and Europe during the Roaring Twenties. Overall, it was somewhat better than meh, but if you are only going to read one book this year, pick another book. Eye of the World by Robert Jordan. This is the first book in a long series of fantasy quest books. My husband is reading the series and I thought I'd join in the fun. The book was fairly good, but seemed scattered. Maybe it was me, but several times things seemed to happen out of order. A character recovered, only to get sick a few pages later. Someone else wore a new scarf only to receive the scarf as a gift afterwards. Otherwise, interesting story and I will read the second one. The Crime Writer by Gregg Hurwitz. I will have a tough time conveying how much I enjoyed this book. I read a lot. A LOT. I have a nasty habit, though, of figuring out the book early on and then despising myself for wasting time finishing it. Whereas I did plot out the ending, it was only one of many endings I devised and I was pleasantly carried through the ending, eager to find the resolution. I've never read Hurwitz before, but I will definitely read him again. Trivia: he is Robert Blake's son-in-law. This book list is incredibly short. Two words explain this: Project Runway. Yes. We finally got cable. I went through a serious Americana phase as a quilter. The blocks were from a Marti Michell fat quarter mystery. There were 10 blocks, so the other two are in a tablerunner that I gave to my mom. I recently visited a town where the streets are paved with chocolate; Quilt Odyssey is held in Hershey, PA! 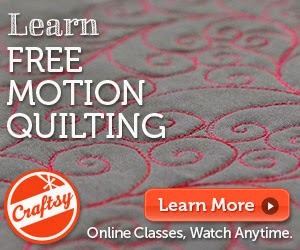 The picture above includes a genuine Handi Quilter rep! I met with blogland's own Amy and her husband one day. I saw her baby bump!!! On Sunday, I got to see the quilt exhibit. Humbling. I made a drunkard's path block and thought it looked like a fish. So I ran with it. I was arranging all the fish when my husband suggested that the school of fish actually be in the shape of a fish. And so it was. This quilt is a 'hospital' quilt. My daughter had a few operations when she was young. If we knew ahead of time, I tried to make her a new quilt. She liked having them with her and it gave me something to do while waiting and worrying, too. Now we have no more hospital visits, but we do have a small collection of quilts. A group of quilters, including my favorite lawyer, met together once a month for over a year and swapped focus fabrics. I think there are over 300 different fabrics in this quilt. After all the collecting, I was so excited to finish piecing it. I laid the top over my bed and proudly showed my daughter when she came home from school. I announced, "Look at what I made for you!" Her reply? "I don't like it." I'll admit to being somewhat miffed, but she was such a cute first-grader, I had to forgive her. I set about quilting and binding it, since it was now for ME. Once finished, I again laid the quilt over my bed. My daughter saw it some time that afternoon and it disappeared into her room. It's been hers ever since. I guess she liked it after all. I received a present, and I'm not sure who left it for me. It was icky. Both boys were awarded and praised appropriately for that most thoughtful gift ... which was left on the floor at the top of the stairs ... very, very dead. Aren't you glad I didn't take a picture of the mouse? It was made with Tonga Batiks Dime Squares. The pattern was so easy and incredibly fun. The only drawback for me was that it was a little small. I'm not much in need of small quilts, so I added borders. I'd probably double the size next time (and there will be a next time). The photos are not the best because I'm fighting with hotel lighting. Sorry. Truth is Stranger Than Fabric? And she can quilt, too! OK, so that part wasn't true. I have about 100 shots just like this. It was a wonderful day spent with wonderful folks. It's great to enjoy your in-laws! It's one of my earlier quilts. The pattern was designed by my friend. She did a great job, didn't she? Black, white, and red will always be one of my favorite combinations. I do it much differently now, but I learned a lot from this one. This quilt used to be my nap quilt. It's replacement is very different, but makes me just as happy. I still love this old quilt, but I don't love the old batting that I used. It's bearding -- ick. Please notice that the laundry lines are empty in this series of photos. I hang laundry every morning, but snapped a quick picture before it included all the clothes we sweated through yesterday. Did I mention that it's been horrifically hot? And that I don't have air conditioning? Please feel bad for me. 5. Ants in my kitchen. It lives on my sofa. I love the pattern. It's from Thimbleberries, in Beginner's Luck, one of the best quilt books ever. I've made quilts from this pattern several times, and it's great for working down your stash. I think it uses 5-one yard cuts of fabric for the quilt. Binding and backing not included. I would love to tell you that all the fabrics were from my stash, but alas, no. They actually came from the $5 rack at the local quilt shop. Didn't they work together well? please ignore my laundry hanging in the photo. thank you. It's another old Thimbleberries Club Quilt from 2003. I have all four of these quilts pieced, quilted, and bound, so the rest will show up on the Quilt Tour eventually. HT to Bonnie for the pieced back suggestion. Rubbing elbows with famous people is always exciting. Some of my favorite quilters are featured on Carol Doak's blog. Check them out. They are famous (and smart and pretty and talented, too!). 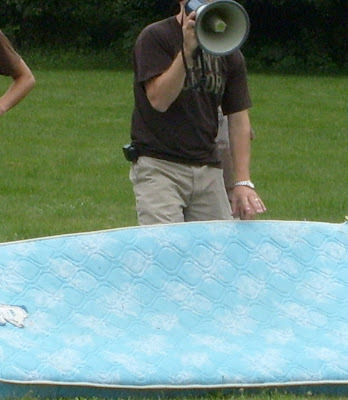 I have tons of pictures of how the mattress was destroyed, but I won't post them since students are involved. 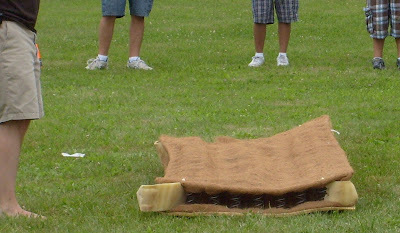 Trust me when I say that watching 76 high school students compete against each other to drag a mattress across team lines was Hi-larious. Isn't he cute??? I think I'll name him Bob. Me: Do you have the car on the lot? Me: Before I drive there, can you confirm that it's automatic and has cruise control? Me: It has cruise control? Me: But it's an automatic transmission? Me: Are you saying that the automatic transmission comes standard on the car? Me: So you weren't saying that it had a standard transmission. Saleslady: Right. Automatic is standard. I made this at a Guild Retreat back in the 1990s. I think this retreat is where I met my favorite lawyer (hi P!). We all worked on our own projects separately but were each given this quilt kit. I learned how to do French knots, something my hand-embroidery mother could never get me to do correctly, much to her chagrin. We fused the fabrics to make them stiff. This quilt also gave me my first experience with needle turn applique. I finished the entire quilt that weekend, which means it was quilted on my domestic machine which means it is very badly quilted. Aside from lousy quilting, I really like this little quilt and it makes me happy every time I walk up the basement stairs. I hope you enjoyed it as well. I have a confession: I'm absolutely worthless when it comes to decorating my house. There, I've said it. Fortunately there's help. When we bought our living room furniture 3 years ago, it looked like someone just unloaded it in the room. I was hoping for that cozy and warm look. It didn't happen. Then I met Marcy. she went nuts. She literally grabbed it off the hallway wall and it is featured in the living room now. It is an old Thimbleberries Club quilt. For the rest of the room, Marcy found some lamps, bunches of candles, a floor lamp, another quilt, a Redoute print, a Gunthart print, some baskets, framed photos, and some candle sconces. She pulled things together quite nicely and then suggested I get some tables. I've added a few other things since then, but it was much easier when I knew where I was headed instead of "here's some furniture in a big empty room ..... go and decorate it". I've enjoyed my living room for the last three years, but my husband is now making noise about changing things around. You see, we have a Wii and he thinks we could have more room to jump around if the furniture were arranged differently. I'll let him give it a shot, but I'm looking up Marcy's number just in case we need a little help. For the curious, I think I paid Marcy $100 for her services. She arranged my living room and another room for that price. It was a Christmas present to myself. We're debating the name of this quilt. Un-calmness. Zany. That Quilt With The Veggie Tales Fabric. I've never done a straight-line meander before and it was really fun. The quilt is kind of stiff, though. The thread was 30-weight and thick, and I used a lot of it! I'm sure I'll use this quilting pattern again, but probably not for a baby quilt. I like them to be more drape-y. And it was finished by Friday! The flash washed the color out a bit. The fabric is truly black, and the thread is black with gray/blue tones. The quilting pattern is called Pipeline, I think. I am completely thrilled with this bag and might have to make another one for myself someday. This is the first of several. It's amazing the fabric you find when you clean out the dining sewing room. Off to sew and see what I can finish by next Friday!!!! Does anyone know if a late-night car drop-off considered a date? If it is, my husband and I have been going on dates regularly for quite some time now. I love this quilt. It hangs in the hallway between my kitchen and studio. I get to see it every day and think of my dear friend. And then I call her and talk her ear off. Just ask her. And then ask her why the quilt is blue and yellow. They might be her favorite colors. If the pictures seem a little dark, I took them after dinner. I live in the woods and there's not much sun. What little light we have is best on the back porch so I take most of my pictures out there. Need proof? My son holds my quilts for me. He's such a good boy! He was bending to keep as much of himself out of the photo as possible (it didn't work). I posted this picture because he wouldn't let me post the ones of his nose poking over the top of the quilt. Maybe another day. And someone should probably refill that gas tank.